Edmonton, AB – At a time when housing prices continue to fluctuate, an Edmontonian has decided to put some money into a different kind of investment – a piano. In the world of piano makers, the Fazioli is considered to be the closest thing you can get to a Stradivarius. 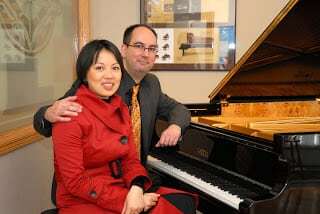 International concert pianist Boris Konovalov makes Edmonton his home, and has performed on hundreds of pianos in concert halls all over the world. He calls the Fazioli an “instrument of great beauty”, and “a dream for any pianist to perform on”. Konovalov has been invited to give a small demonstration on the Fazioli piano at a media event. Konovalov is widely praised for being ‘one of the most brilliant pianists’ with a powerful technique, a sensitive musician that leaves deep impressions on audiences all around the globe. Fazioli is the new kid on the block in the world of piano making – a place that doesn’t often get newcomers. In 1979, Paolo Fazioli – himself a pianist and an engineer – decided that he wanted to create the best piano known to man. It has parts plated in 18K gold, and the soundboard is carved from the same trees that Antonio Stradivari used for his famous instruments. Fazioli has been gaining a strong following in recent years, including jazz legend Herbie Hancock, and the world’s leading renowned Bach-expert Angela Hewitt. This Fazioli F183 is the third Fazioli piano to arrive in Alberta, and the first to arrive in Edmonton.